Wheels: 18" 5-Spoke Painted Aluminum, Valet Function, Unique Cloth Bucket Seats -inc: 10-way power driver seat w/power lumbar and recline, 6-way power passenger seat w/manual recline and 4-way adjustable driver and front-passenger head restraints (2-way up/down when dual-headrest DVD entertainment system (50S) is ordered), Trip Computer, Transmission: 6-Speed SelectShift Automatic, Towing Equipment -inc: Trailer Sway Control, Tires: P245/60R18 AS BSW, Tire Specific Low Tire Pressure Warning, Terrain Management System ABS And Driveline Traction Control, Tailgate/Rear Door Lock Included w/Power Door Locks. 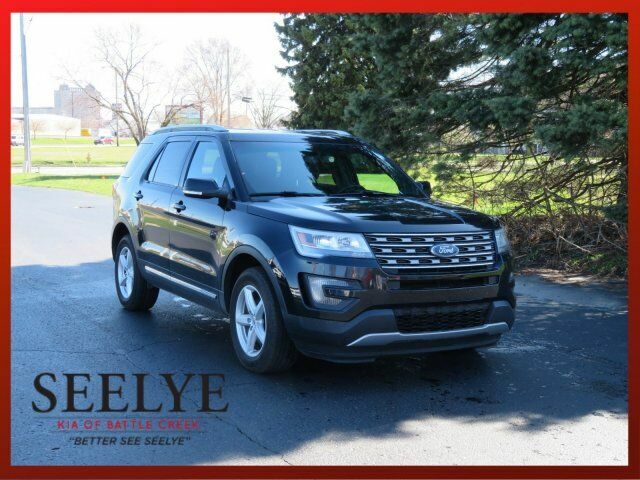 This Ford Explorer has a dependable Regular Unleaded V-6 3.5 L/213 engine powering this Automatic transmission. Systems Monitor, SYNC -inc: enhanced voice recognition communications and entertainment system, 911 Assist, 4.2" LCD screen in center stack, AppLink and (1) smart-charging USB port in the Media Hub, Note: SYNC AppLink lets you control some of your favorite compatible mobile apps w/your voice, It is compatible w/select smartphone platforms, Commands may vary by phone and AppLink software, Strut Front Suspension w/Coil Springs, Streaming Audio, Steel Spare Wheel, Speed Sensitive Variable Intermittent Wipers, Side Impact Beams, Securilock Anti-Theft Ignition (pats) Engine Immobilizer, Seats w/Premium Cloth Back Material, Safety Canopy System Curtain 1st, 2nd And 3rd Row Airbags, Roof Rack Rails Only, Remote Keyless Entry w/Integrated Key Transmitter, Illuminated Entry, Illuminated Ignition Switch and Panic Button, Rear Parking Sensors, Rear HVAC w/Separate Controls, Rear Cupholder, Rear Child Safety Locks, Radio: AM/FM Stereo w/Single CD/MP3 Capable -inc: 6 speakers and SiriusXM radio (subscription required), Note: Service is not available in Alaska and Hawaii, Note: Subscriptions to all SiriusXM services are sold by SiriusXM after trial period, If you decide to continue service after your trial, the subscription plan you choose will automatically renew thereafter and you will be charged according to your chosen payment method at then-current rates, Fees and taxes apply, To cancel you must call SiriusXM at 1-866-635-2349, See SiriusXM Customer Agreement for complete terms at www.siriusxm.com, All fees and programming subject to change, Sirius, XM and all related marks and logos are trademarks of Sirius XM Radio (subscription required) Inc, Radio w/Seek-Scan, Clock, Speed Compensated Volume Control and Steering Wheel Controls, Quasi-Dual Stainless Steel Exhaust w/Chrome Tailpipe Finisher, Proximity Key For Doors And Push Button Start. KBB.com 5-Year Cost to Own Awards, KBB.com Best Buy Awards Finalist, KBB.com Brand Image Awards.